If you’re looking for an offbeat, slightly off-kilter Christmas show, Richmond Triangle Players’ production of Who’s Holiday is the perfect match. Billed as the story Dr. Seuss didn’t want you to see, the dark comedy introduces us to Cindy Lou Who all grown up and living in a dilapidated trailer in the hills of Mount Crumpit. We last saw Cindy Lou as a wide-eyed innocent young girl, but much has happened since she first met the Grinch. 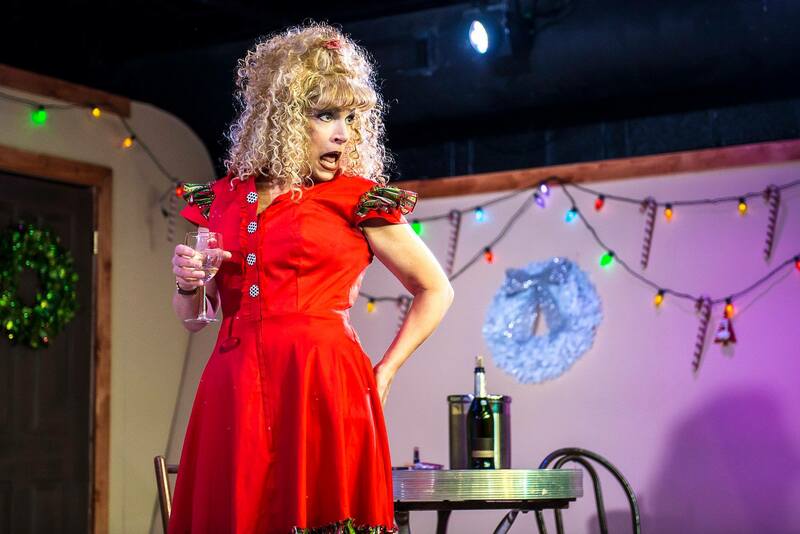 This sassy, tongue-in-cheek production tells Cindy Lou’s bizarre story and it’s anything but innocent – think unconventional soap opera. Cindy Lou now has a daughter, Patty, the product of Cindy Lou’s relationship with the Grinch. But until now, Patty has stayed far removed from her mom’s situation. While the show does have lots of humorous moments, those moments are countered with some dark, uncomfortable moments that – in my opinion – playwright Matthew Lombardo could have left out completely and they would not have been missed. The bright light that this show brings with it is Kimberly Jones Clark who plays Cindy Lou. Her extraordinary performance is about as entertaining as it gets. Her interaction with the audience is quick and witty. Her characterization of a down-on-her-luck-but-still-hopeful-and-clueless Cindy Lou mesmerizes. I can’t imagine memorizing all the dialogue she has in the approximately seventy-five-minute show but she does it with ease and makes it look completely natural. Who’s Holiday is an adults-only show that will definitely give you an entirely different take on Christmas. The show runs through December 15 at the Robert B. Moss Theatre at Triangle Players in Scott’s Addition. For showtimes and tickets, go here.